Bonanza Books. Hardcover. 0517003937 Item in good condition. Textbooks may not include supplemental items i.e. CDs, access codes etc... . Good. Bonanza Books. Hardcover. GOOD. Spine creases, wear to binding and pages from reading. May contain limited notes, underlining or highlighting that does affect the text. Possible ex library copy, thatâll have the markings and stickers associated from the library. Accessories such as CD, codes, toys, may not be included. Bonanza Books, 1988. Hardcover. Acceptable. Disclaimer:A readable copy. All pages are intact, and the cover is intact. Pages can include considerable notes-in pen or highlighter-but the notes cannot obscure the text. At ThriftBooks, our motto is: Read More, Spend Less.Dust jacket quality is not guaranteed. Bonanza Books, 1988. Hardcover. Good. Disclaimer:A copy that has been read, but remains in clean condition. All pages are intact, and the cover is intact. The spine may show signs of wear. Pages can include limited notes and highlighting, and the copy can include previous owner inscriptions. At ThriftBooks, our motto is: Read More, Spend Less.Dust jacket quality is not guaranteed. Bonanza Books, 1988. Hardcover. Acceptable. Disclaimer:A readable copy. All pages are intact, and the cover is intact. Pages can include considerable notes-in pen or highlighter-but the notes cannot obscure the text. The dust jacket is missing. At ThriftBooks, our motto is: Read More, Spend Less. New York: Bonanza Books/Crown Publishers. 1954. Hardcover. Very Good. Prior owner's name on FFEP, otherwise unmarked. Shelfwear. Not ex-library. Not remainder. Not clipped. No tears. 377+vi pp. 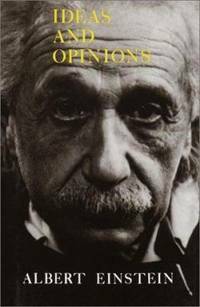 Essays by Albert Einstein on subjects ranging from atomic energy, relativity, and religion to human rights, government, and economics. Previously published articles, speeches, and letters are gathered to create a fascinating collection of meditations by one of the world's greatest minds. Wings. Used - Good. Ships from Reno, NV. Shows some signs of wear, and may have some markings on the inside. 100% Money Back Guarantee. Shipped to over one million happy customers. Your purchase benefits world literacy! Wings. Used - Very Good. Ships from Reno, NV. Former Library book. Great condition for a used book! Minimal wear. 100% Money Back Guarantee. Shipped to over one million happy customers. Your purchase benefits world literacy! Wings. Used - Good. Shows some signs of wear, and may have some markings on the inside. Bonanza Books. Hardcover. 0517003937 Never Read- has wear to the cover and edges- Good Copy- Ships in 1 business day from my GA location! . Very Good. Book condition: Very good in very good dust jacket. Dust jacket showing some light shelf wear. Dust jacket in protective cover. New York, NY: Wings Books, 1988. Edited by Mein Weltbild. Hard cover. Very good in very good dust jacket. Dust jacket showing some light shelf wear. Dust jacket in protective cover./New translations and revisions by Sonja Bargmann.. Sewn binding. Cloth over boards. 384 p. Audience: General/trade. New York, New York, U.S.A.: Bonanza Books, 1986. 377pp. Extremities book & Dj lightly rubbed; owner name ffep.. Reprint. Hb. VG/VG. New York, New York, U.S.A.: Bonanza Books, 1986. Later Printing. Hard Cover. Very Good/Very Good. 8vo - over 7¾" - 9¾" tall. In pictorial jacket over yellow boards, 8vo, 377pp. Bonanza Books. Hardcover. 0517003937 Crisp pages and tight binding. Light shelf wear on dust jacket. Light shelf wear on cover. Sun fading. . Fine. NY: Bonanza Books. 1994. vg+. Hardcover. Essays ranging from atomic age to religion, government, + human rights. based on Mein Weltbild edited by Carl Seelig. 376pp; interior clean + tight; price clipped dj; ISBN:0517003937 . New York: Bonanza Books, 1954. Grey boards have trace of wear. 377 pgs. Text is clean & unmarked, binding is tight.. Hard Cover. Good +/No Jacket. 8vo - over 7¾" - 9¾" tall. Bonanza Books, October 1986. Hardcover . Used Good. We carry new and used books in our storefront. We want you to be satisfied with your purchase. Please contact us if you have questions regarding this item. Bonanza Books, 1988-12-12. Hardcover. Acceptable. Dust Jacket Included and in Poor condition. Hardcover.Binding loose.No writing, highlighting, or marks in text. NY: Bonanza Books, 1988. Book. Very Good +. Boards. Reprint.. 377 pp. Firm, clean, nearly new, upper corners bumped. 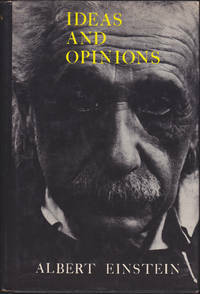 A selected anthology of Einstein's popular writings. Size: 8vo - over 7¾" - 9¾" tall.